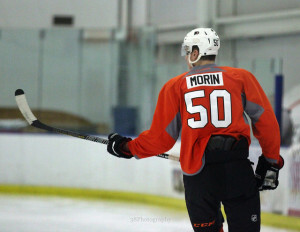 Will Samuel Morin Crack the Flyers Lineup? The Philadelphia Flyers’ roster was trimmed down to 26 players on Wednesday, with Shayne Gostisbehere, Scott Laughton and Zack Stortini taking the bus back to Leigh Valley. However, there was one intriguing name still left on Philadelphia’s roster as the team’s final preseason game approaches. 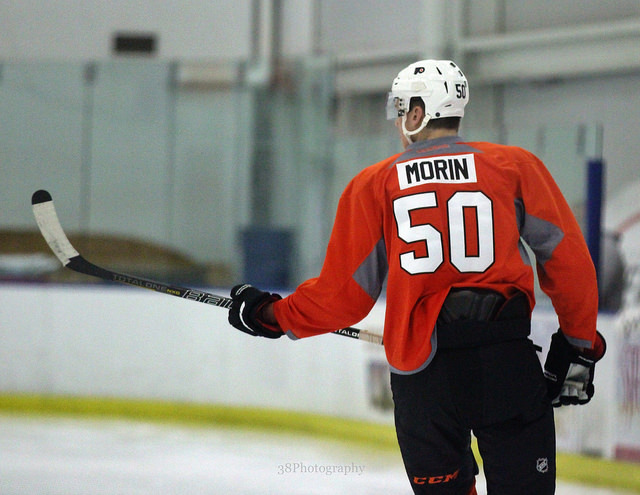 2013 first-round pick Samuel Morin. You know, the one that pundits have compared to another Flyer by the name of Chris Pronger. Morin has impressed throughout the preseason, displaying the keen ability to use his size to his advantage, an active stick in his zone and a calming influence with the puck during his brief stint with the big club in training camp and in tilts throughout the preseason. This doesn’t mean the 19-year-old’s game has been flawless. He’s had defensive miscues during these contests, but Morin’s confidence has been on full display. He already believes he’s close to being NHL ready, and one has to think that this assessment isn’t too far-fetched. With the first-rounder’s game a little more NHL ready then what people projected, would it be the worst thing to keep him with the Flyers? At the very least, give the defenseman nine games to prove himself before having to make a decision. This way, the Flyers don’t waste the first year of his entry-level contract if they decide to send him back to Rimouski in the Quebec Major Junior Hockey League. What are the benefits of Morin to go back to juniors? At 6-foot-7 and 225 pounds, Morin is much more physically imposing in juniors, and even he’s admitted it’s become a little too easy to overpower players 1-on-1 now. Unfortunately, the AHL is not an option. With one year remaining on his junior eligibility, Morin would automatically be sent to his team, the Rimouski Oceanic. There are some things he could improve on in the QMJHL — his offensive game, for example, could be something that is honed and advanced before taking another crack to make the Flyers’ roster next season. His temper also needs to be contained, but that’s something that comes with maturation. I’m not against nastiness on the ice, but with a team that led the NHL in penalty minutes last season, may not be the best idea to add another player who could go off for a retaliation-like penalty. Although, with what Morin has shown throughout the preseason, general manager Ron Hextall and coach Craig Berube should give the young blueliner a shot through the first few games of the regular season. The problem — who would Morin replace along the Flyers blueline? Braydon Coburn, Andrew MacDonald, Mark Streit and Luke Schenn are entrenched in the three pairings for the Flyers. Michael Del Zotto, another player you can pencil into the pairings, will quarterback the second power-play unit and is the only other Flyer, beside Streit, who has the potential of making an impact in the offensive zone. That leaves Nicklas Grossmann. The 29-year-old blueliner is an offensive sinkhole and not the fleetest of foot on the ice. He does block shots, bring physicality to the Flyers’ defense and is one of the team’s best penalty killers, something that shouldn’t be overlooked. But would there be such a significant drop off if Philadelphia gave Morin the reins and paired him Streit? I’d be curious to see. However, Philadelphia’s first month of the schedule is brutal, with 10 of the 11 games coming against opponents who made the postseason last year, a point that Kurt R. from Broad Street Hockey brought up that could deter the Flyers from keeping the youngster around. But on the other hand I just looked at the Flyers’ October schedule again and they may not want to throw Morin into that fire. So who knows. There are no guarantees that Morin is on the Flyers’ roster once the puck drops in Boston on Oct. 8, but his play has made things difficult for Hextall and Berube. The Flyers general manager has said that he would like to take the slow-and-steady approach when it comes to bringing along his young defenseman, but the inspiring play throughout the preseason must give him some confidence that the future is bright along Philadelphia’s blueline.